Guinness is handing out the video game world records left and right, and now it's Sony's turn. They've assembled a crack team of LittleBigPlanet 2 players to take down fabricated records next week, and you can watch. Why isn't there one of these records for every game in existence? Okay, this one is pretty valid. Sounds pretty tailored to me. StarCraft II modders need to get in on some of this action. We're just piling them on now! 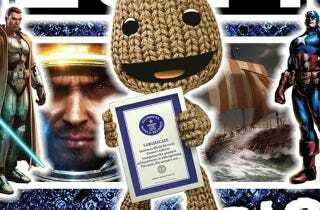 On top of these record attempts, Guinness will also be recognizing LittleBigPlanet 2 for Most Gaming Genres in One Video Game and Most Player-Created Levels in One Video Game. The event is taking place at the Sony Style store in New York City, but if you can't make it the PlayStation blog will be streaming the marathon record attempts live. Be sure to tune in come Monday, because nothing is more exciting than watching other people playing LittleBigPlanet 2 via blurry internet video. Sorry this post is so negative. I'm aiming for the Most Critical Article Regarding Guinness' Made-Up Gaming Records on Kotaku record.